I'm honored to report that this public art was commissioned by and is now in the private corporate collection of Scott Mueller, CEO of Dealer Tire, LLC and Vice Chairman of the Board at MOCA Cleveland. Will you celebrate with me for the auction and benefit dinner ? Click to enlarge the invitation below. 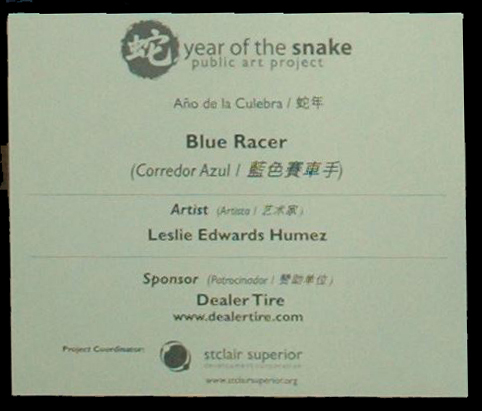 I'm absolutely delighted to have had my snake design chosen for production in St. Clair Superior Development Corporation's annual Year of the Snake public art project, and equally gratified to know that Blue Racer is to become a part of the extraordinary corporate art collection of Dealer Tire. On public display at 3711 Chester Avenue, this sculpture is 1 of 25 bringing smiles to passers-by in Asiatown and around Cleveland's near east side. 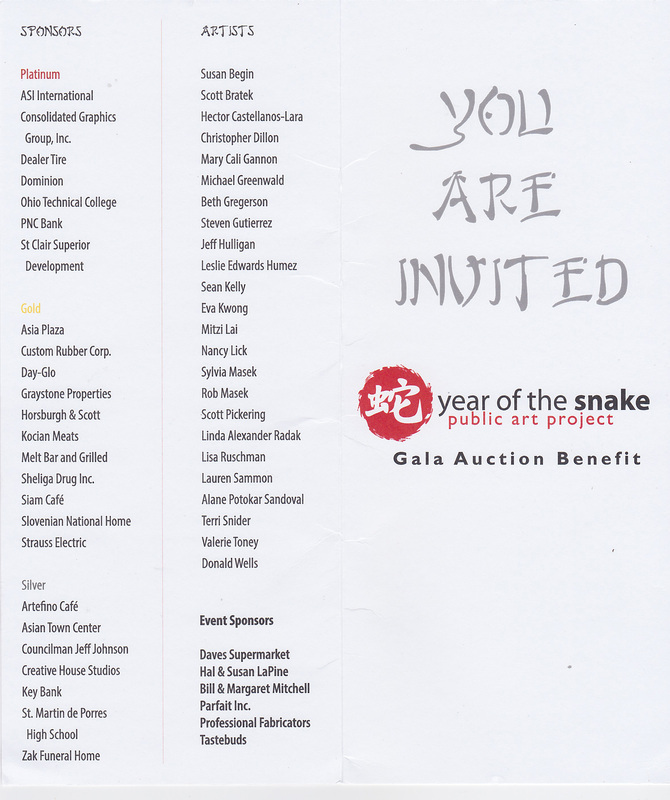 As the 2013 lunar year of celebration draws to a close, I'd like to thank those who made this public art project possible, and invite everyone to join us for this gala auction benefit. Tickets are available at www.stclairsuperior.org or you may call 216- 881 0622 x 107 for details. RSVP to them by September 17th. Have you driven past and seen it? Found my thumb prints or your initials hiding on the snake? If you answered yes, let me know, and I'll add your name to the sweepstakes drawing. Thanks to all of you who have already sent notes and photos! Click here for the location of all the snakes. 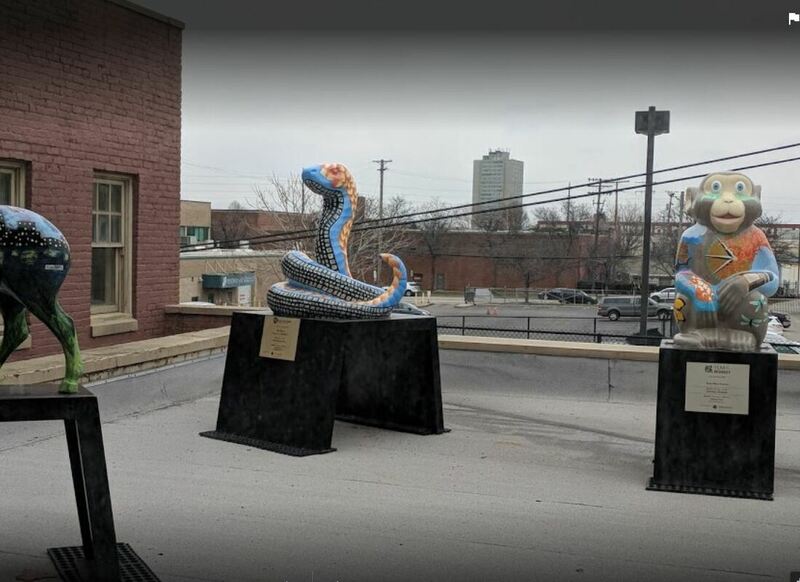 Here's the slideshow including the names of the artists who created the snakes. The views of downtown Cleveland and Lake Erie from the Ariel International Center's Skyline Lake Room were breathtaking! Thanks, SCSDC for a very grand opening. Fox News buzzed this morning with this public art project. Facebook makes mention of the broadcast and has a few photos of other snakes, too! Hats off to my pals Diane and Ted who provided the info. Next post will be photographs from the unveiling reception. Click here for SCSDC updates. Photo below: Fox 8 Kicking with Kenny Live today. Blue Racer has two secrets: my thumbprints and lots of initials which will eventually disappear when exposed to sunlight. Hidden in plain sight are the initials of those who made the snake possible, either with support and information or by way of encouragement, friendship and love. You can see Blue Racer beginning May 9, 2013, just outside the entry to Dealer Tire —3711 Chester Avenue, Cleveland, Ohio. Thereafter, the sculpture will be housed inside, in the company's private collection. In this slideshow, my friends Barb and Marilyn each points to her initials. Bob the studio cat searches carefully for his and then looks away when he remembers he still hasn't learned to read. Moments later we loaded the sculpture in the van for delivery to Ohio Technical College where it will be given several coats of automotive clear coat to protect it from the elements. In the final photo in the slideshow, Blue Racer sits in the OTC warehouse near the spray booth. Bon voyage! I'm getting down to the wire! In the last two days, I added two coats of orange metallic varnish over the flames on the snake's body, and a third coat of high gloss sealer overall. The orange paint took on a yummy patina in the process. After completing the yellow/peach/orange sequence I decided it needed a bit of red/burnt sienna so deepened the intensity of the coloration by adding just a bit to the base of each flame. You may be able to see that I'd completed the job just about halfway up the snake's neck before daylight began to fade — and the cat woke up. I began at the tail primarily to keep out of my own way on the overlap, working on small sections at a time. The pointed portion of each flame was masked to keep the edges sharp. Outer edges were done freehand. Tips received a coat of opaque yellow first. The center of each scale is a peachy, flesh color which was dragged into the yellow; the broadest part of the scales are painted a deep orange. I labored over the course of a four days until the head and face were complete. As you may have noticed, even Bob the studio cat has begun to watch the process from his perch in front of the window.